Fulfilling the potential of his Matrix character title, Keanu Reeves proved that he is also The One when it comes to auto racing. 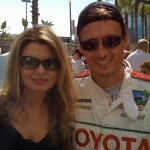 He took the checkered flag in the competitive celebrity field at the 2009 Toyota Pro/Celebrity Race as part of the 35th Annual Toyota Grand Prix of Long Beach, California. The star of blockbuster films like The Matrix, The Day The Earth Stood Still, and Speed, Reeves finished first among celebrities in a mixed field that included racing pros Al Unser Jr. who won the Pro division with just five seconds ahead of Keanu. Other participating celebrities included Oscar winner Adrien Brody, Jeopardy host Alex Trebek, comedian Carlos Mencia, 24 star Mary Lynn Rajskub and From G’s To Gents host Fonzworth Bentley. The event is a popular tradition during the festivities of the Grand Prix weekend, and had the crowd cheering on their favorite celebs throughout the entire race. 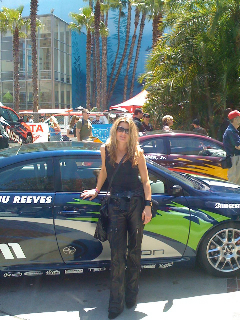 Both celebrities and professional racers were very success driven as they attempted to win some funds for charities, driving Scion tCs that had been performance modified for the event especially. Not that it made car racing any safer. 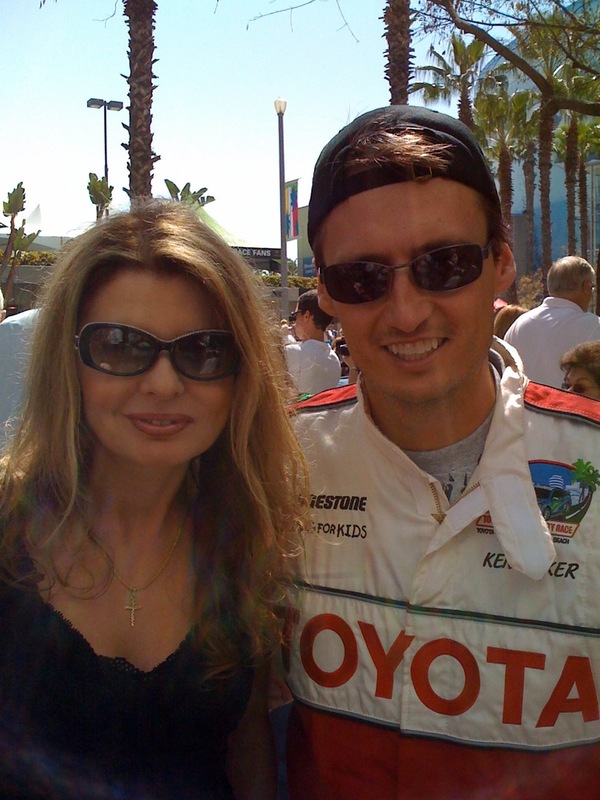 With proper training and practice, competing celebrities learned the driving skills needed to navigate the 1.97-mile racetrack through the streets of downtown Long Beach. 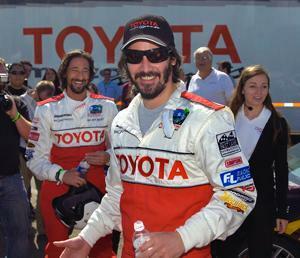 And although their competitive natures came out during practice, the drivers also enjoyed the camaraderie of experience, which is what the Toyota Pro/Celebrity Race is really all about. World champion pro skateboarder Danny Way led the celeb race for the most part, but got tangled up with Fonzworth Bentley on the ninth lap and ended up hitting the track wall in a head on collision. Reeves then gained the speed necessary and seized the opportunity to cross the finish line first, just seconds in front of E! Entertainment Television’s Executive News Editor, Ken Baker, and comedian Carlos Mencia. Carlos was a funnyman off track and on. Now the popular multitalented actor (also bassist for rock band Dogstar, and a fan of the heart warming documentary, Anvil! The Story of Anvil!) can add car racing to his resume. It’s probably too early to tell if he has the same bug that got into the blood of actors like Paul Newman, Steve McQueen and James Dean, but Reeves looked like a natural in his red and white Toyota racing suit, and took the checkered flag with great enthusiasm for a great cause. He is an active supporter of many charities, including Angelwear, City of Hope, Coach Art, PETA, Stand Up To Cancer and Wildlife Way Station. Reeves’ acceptance of the trophy was followed by contributions to various charities, which made everyone’s participation all that more worthy. Toyota donated $5,000 to “Racing for Kids” in the name of each celebrity racer, and another $5,000 to the winning racer’s charity of choice. Racing for Kids is a national non-profit program benefiting children’s hospitals in Long Beach and Orange County, California. Another $15,000 donation was made in conjunction with the annual “PEOPLE Pole Award.” Sponsored by PEOPLE magazine, the award was given to Danny Way who was the pole-position winner of the qualifying session. Way selected the Action Sports Environmental Coalition (ASEC) as his charity. Keanu Reeves’ big win will also benefit the charities of his choice, and adds to the list of his contributions on so many levels, not just to film, but also many other causes. About the Writer: Adrienne Papp is a recognized journalist who has written for many publications including Savoir, Beverly Hills 90210, Malibu Beach, Santa Monica Sun, The Beverly Hills Times, Brentwood News, Bel-Air View and Celebrity Society, among many others. She is the President and CEO of Los Angeles/New York-based publicity companies, Atlantic Publicity and Atlantic Publisher. 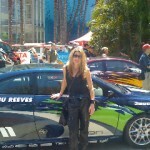 Adrienne writes about world trends, Quantum Physics, entertainment and interviews celebrities and world leaders.